Successful completion of the above results in a STEM2 transcript certification and Honors Convocation recognition during the candidate’s senior year. Click here to download the STEM2 Handbook for the Class of 2017. Click here to view a document explaining how you can help support CA's trip to the 2017 VEX Robotics World Championship! In 2015, Concordia Academy’s first-ever robotics team won the Minnesota VEX Robotics State Championship. 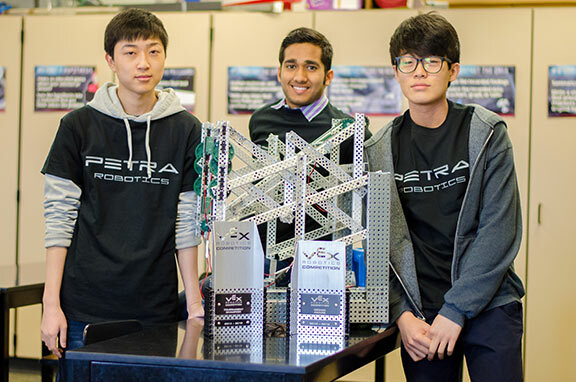 The CA team’s robot also received the prestigious “Best Overall Design Award.” Having won the State Championship, the team received an invitation to the VEX Robotics World Championships, competing with the very best of over 450 teams from 32 different countries.